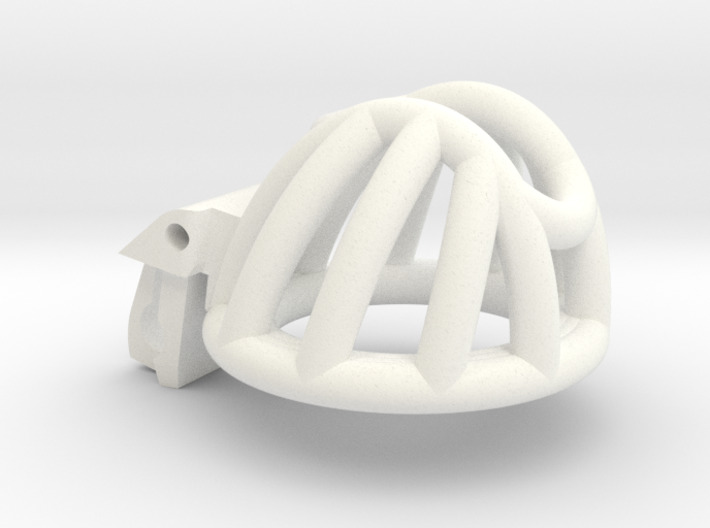 This is a short cage for The Cherry Keeper Chastity Cage, offering a total length of ~2" (51mm) - to have a complete product you must have two parts, a ring and a cage. This cage is designed to be a good starting size for growers, and offers a circular shape to the cage for an easy fit. The spacing of the bars at the front means urination won't be a problem, while the cross bars prevent the tip from slipping through. The Headlock feature adds a smaller ring to the entrance to the cage, restricting the opening in such a fashion as to hold the head in place when properly sized. The Headlock ring will also put an end to casual pull-out attempts if a sufficiently large Headlock size is chosen. No device of this style is 100% secure, but Headlock makes it so that a serious effort must be put in to escape. Headlock is offered in three variations: Small (1.5 mm), Medium (3.0 mm), and Large (4.5 mm). The Size refers to the offset between the cage ring and the smallest headlock ring, with the Large variant having the smallest opening. If you're unsure of which to choose, choose the Medium for the best balance of comfort and anti-pullout.